Performer is seen holding an ordinary face down deck of cards. 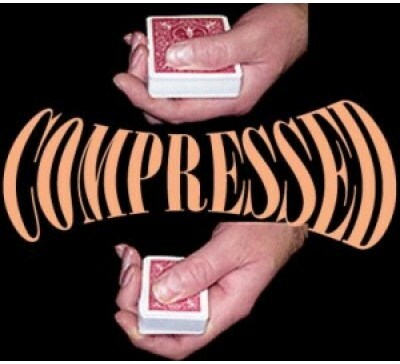 With an empty hand, the performer covers the deck. After a few seconds, the performer removes his empty hand from the deck. The deck has shrunk to half its size!!! This mini deck is now spread both face down and face up showing it to be quite ordinary. The mini deck can now be used in your next effect if you desire. Completely mechanical, no sleight of hand, no magnets, no elastics, perform in short sleeves, resets in seconds, great opener, complete with mini Bicycle deck*, gimmick, photo illustrated instructions, learn in 5 minutes. NOTE: Bicycle mini deck included will be Blue or Red. Choice of color not available.